Can human beings literally become equal with God? What exactly would that mean? Are these questions "childishly absurd"? Or even blasphemous? Many people think so. But not God. And it's His Plan and His universe — He should know! THE BIBLE states that the purpose of human life — the ultimate goal for all human beings — is to eventually be born into the God Family, to eventually become equal with the Creator of the universe! Shocking? Undoubtedly. But this remarkable fact is surprisingly easy to prove. There is no difficult "exegesis" (scriptural analysis) involved. Symbolic logic is unnecessary. Complex philosophical arguments are not needed. And Hebrew can even be "Greek" to you — and you can still understand this simple, beautiful truth. 1) The Creator of the universe is the One who became Jesus Christ (John 1:3, 10; Colossians 1:16; Ephesians 3:9; Hebrews 1:2). 2) Jesus Christ is equal with God (John 5:18; Philippians 2:6). 3) We are joint-heirs with Christ, and as a sure result, we will all be glorified together with Him (Romans 8:17). 4) Whatever glory God the Father had given Christ — the position of Creator — Christ will eventually give to us (John 17:11 and 22). In other words, every converted individual will eventually enjoy the same relationship to Christ — God the Creator — as Christ presently enjoys with God the Father. In another sense, all that is required is a "childishly simple," word-by-word reading — without interpretation — of Genesis 1:26. Here God succinctly gives the purpose of human life: Whereas animals reproduce after the animal kind, man reproduces after the God kind! Or, more properly phrased, human beings are the instruments through which God is reproducing Himself. Which means that you were born to literally become a SON in the God Family-Kingdom. Now that is not a dark saying. It is not the esoteric wisdom of a far country. And it is surely not cloaked in mystery. God's Plan is straightforward. It is explained and expounded in dozens of scriptures. You can scrutinously investigate all of the myriad denominations, synods, sects, cults, orders and offshoots that this world has to offer — and never find even a remote allusion to the fact that God is a Family, that God is reproducing Himself, and that man was created to literally become God. Now there is certainly no dearth of ideas floating around. Any way you want it, you can find it — some religion is sure to feature it. This world's religious system offers EVERY conceivable possibility for man's ultimate destiny: everything from angelic beings to eternally physical beings, everything from dis-embodied souls to transmigrated bodies — everything but the truth. Looking for a purpose in life? Check your newspapers, magazines, yellow pages, grocery store bulletin boards, college campuses. Find yourself a religion that suits you. You've got thousands to choose from. Surely at least ONE church or organization has been specifically tailored to your tastes. Get yourself an austere one — or one with all the weird variations, special nuances and distinctive frills that the human mind can concoct thrown in as part of the "package deal." Better yet, make up your own "package deal" — invent your own religion. You can believe anything you want. everything but the truth. Anything but the incredibly awesome fact that every human being was designed to grow up to join the God Family. We repeat: No religion of this world even comes close to hinting that man's purpose in life is to be born AS A SON into the Family of Almighty God. Now that all by itself should seem rather odd. In all the wide spectrum of religious beliefs it would seem that at least ONE would have stumbled upon the obvious, literal word-by-word meaning of the Bible. But none has. 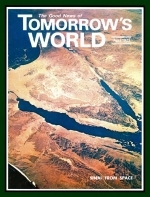 Perhaps we will cover that very interesting point in a later issue of TOMORROW'S WORLD! Now, it is true that a few religious fringers might possibly agree that "man is to become God." But their "God" is not God. They just use this respectable three-letter term as a convenient label to attach to some nebulous, self-satisfying platitude like "Cosmic Consciousness" or to some amorphous, self-glorifying quality like "Infinite Intelligence." And the goal of human life, these self-assured mystics maintain, is to become "At One with the Cosmic Consciousness" and to be "merged into the Infinite Intelligence." This watered-down excuse for a purpose in life is the "calling-card-come-on" of many "mental science" religions — and also figures prominently in some non-Western religions. All of these philosophies have one point in common: They preach the utter dissolution of the individual human personality. You are to be diffused into the "Cosmic Consciousness," absorbed by the "Infinite Intelligence" and swallowed up by "Universal Love" — much like a drop of yellow paint which becomes completely diffused after being dropped into the ocean, or like a decaying human body which becomes totally absorbed into the surrounding soil after many years in its grave, or perhaps like those hapless human minds which were swallowed up by the invading monster brains which terrified us in the science-fiction movies of the 1950's. The Bible absolutely repudiates all such attempts to destroy the dignity and the majesty of each distinctive human mind. Human beings will always retain their individuality — we will become individual personalities in the Father's God family. We were born for the express purpose of literally becoming equal with the creator of the universe — members in the same eternally ruling God Family-Kingdom. But what will we be like? We will do what God does. We will feel, act, enjoy and experience at precisely the same presently incomprehensible level of awareness at which God feels, acts, enjoys and experiences. And we will not lose our unique awareness's and our individual personalities. We will not be diffused into the "Cosmic Consciousness" we will not be absorbed by the "Infinite Intelligence," and we will not be swallowed up by "Universal Love." As a matter of fact, just the opposite is true: The members of God's Family in tomorrow's world will be more distinct from one another than members of the human family are distinct from one another in today's world. All will have their own individually specific memories, abilities, personality traits, jobs, responsibilities, preferences and ideas. But there won't be any competition or conflict. Because the old culprit — self-centered human nature — will have been long since eliminated. Exactly Like God? How's That Possible? When mankind is promised to be made "equal with God," that of course means that individual human beings will eventually become QUALITATIVELY equal with God — and obviously does not mean that individual human beings will eventually become QUANTITATIVELY equal with either God the Father or Jesus Christ. Being "equal with God" only means that we will be in the same God Family as the Father and Christ are in — and has nothing to do with an equality of power, authority, intelligence, etc., WITHIN the Family. In other words, those people who will be changed "in the twinkling of an eye" (I Corinthians 15:52) will share the same exact QUALITIES of life which today are only possessed by God the Father and Jesus Christ. But QUANTITATIVELY, man will NEVER equal God the Creator, just as surely as GOD THE CREATOR (Jesus Christ) will Himself never quantitatively equal God the Father (John 14:28). These two original Beings in the God Family will always remain in overall command. Their absolute authority will never be questioned — although they will delight in sharing progressively more of their responsibilities with their offspring as the God Family continues to expand throughout space and time. We have seen that God is reproducing Himself. And this is what human life is all about. Every individual person has been created to grow toward SONSHIP (Romans 8:14-15) — to become a literal Son of God — a Son who is in every way QUALITATIVELY EQUAL to his Father, yet a Son who is always in thankful and gracious submission to his Creator Father. This overall concept is not difficult to grasp. But it is crucial — because THAT'S WHAT HUMAN LIFE IS ALL ABOUT. Perhaps a practical analogy will help us to more fully comprehend the wonders of God's magnificent purpose — and the majesty of our individual calling. Picture the model of a large family corporation. The Rothschilds of Europe are perhaps the best example. The "Patriarch" father founded the company "from nothing" many years ago. He labored long by himself to build the business. When he begot sons, he desired to prepare them for the time when they could come into his organization. He nurtured them and he trained them. And so, after receiving all the proper education and experience, his sons matured into able, dedicated men. Their father now took great pleasure in turning over much administrative responsibility and governing authority to his sons. Each son was placed in charge of one major division — in addition to occupying a seat on the board of directors. As a direct result, the business was able to expand enormously in many directions at once. The father, of course, still presided over and ran the whole operation — yet it was the collective strength of his sons which made the family corporation grow great. The sons, of course, enjoyed the same QUALITY of life as did their father — intellectually and financially — but the father would always remain somewhat richer in all areas. The sons counseled and advised their father on all decisions — but the father would always be the boss. His word would always be final. Everybody thoroughly loved his work — and his life. A family atmosphere prevailed. And when each son would have his own sons, the ruling family would geometrically increase and the family corporation would continue to grow. SO IT WILL BE WHEN HUMAN BEINGS BECOME SONS IN THE ETERNALLY RULING GOD FAMILY. After being nurtured and trained in this physical life, after receiving all the proper education and experience, we will be able to assume the positions of enormous responsibility and authority which Almighty God will take great pleasure in sharing with us. At that time, each individual Son will have precisely the same relationship with God the Father in administering the entire universe as human sons have with their physical father today when they help administer their large family corporation. And, in the very same analogous manner, we, as Sons of God, will enjoy the same quality of life that God the Father enjoys. Furthermore, as strange as it sounds, we will counsel and advise our Creator Father — we will have suggestions and opinions which will actually help God the Father administer all reality, suggestions and opinions which will be original and unique. Life will be scintillating. Eternity could never get boring: "In thy (God's) presence is fullness of joy; at thy right hand there are pleasures for evermore" (Psalm 16:11). And the God Family will forever expand beyond all the bounds which our restricted human imaginations have erected.